In a mixing bowl combine all the dry ingredients, adding 1 tsp of good quality sea salt or pink Himalayan salt, and stir well. Whisk together the maple syrup, coconut oil (or alternatives) and 350ml water in a measuring jug. Add to the dry ingredients and mix well until everything is completely soaked and the dough becomes very thick – if it is too thick to stir, add one or two teaspoons of water until it is manageable. Place the mixture in either a flexible silicon loaf tin or ordinary bread tin (if using the latter line with a suitable backing parchment and leave some overlapping so you can get the loaf out easily – see cooking instructions below). Smooth out the top with the back of a spoon. Leave for at least two hours, all day or overnight. The dough will not rise but should retain its shape even when you pull the sides of the loaf tin away from it (you can only check this if using a silicon loaf tin). Preheat the oven to 175°C/350°F/gas mark 4. Bake the loaf on the middle shelf of the oven for 20 minutes. Remove from the tin and then place upside-down directly on the oven shelf and bake for a further 30 to 40 minutes. The bread should sound hollow when it is tapped. Allow to cool completely before slicing. The bread will keep in a tightly sealed container for up to five days. It freezes well too – slice before freezing and interleaf with baking parchment for quick and easy toast. 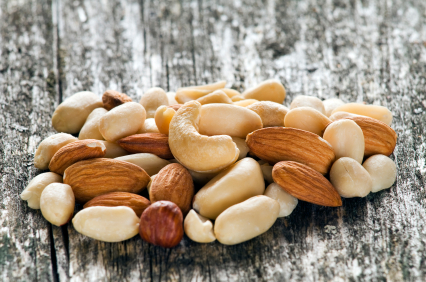 You can of course substitute different nuts and seeds according to your preference or maybe add some goji berries if you want a fruity version.